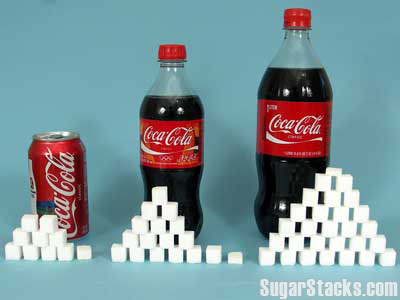 Do you see how many sugar stacks are there in these sodas? Many of us have been warned about the dangers of tobacco, drugs, and alcohol, but soft drinks on the other hand, is viewed as thirst-quenching, refreshing, and rejuvenating drinks that everyone loves. Soft drinks consumption has increased so much due to intense marketing from soft drink companies through advertisements, sponsorship, charities, and kids clubs - targeting especially young children. Serving sizes are getting bigger and bigger and children as young as little babies are drinking soft drinks without realizing the harmful damage it's causing the body. What Are Soft Drinks Made Of? - Sodium. 55 mg of sodium per can is like drinking a pizza! Drinking this much sodium (and while losing free water) will only make you thirstier and you want to drink even more. - Caffeine. Yes, you can get addicted to soft drinks because of the caffeine content. - Phosporic Acid, that leads to lower bone density and tooth rot as phosporic acid lowers the pH of the saliva to acidic levels. - Citric Acid, often contains traces of MSG. - Artificial Flavors, that may contain traces of MSG. - Diabetes from too much sugar. - Tooth decay, osteoporosis, and bone fractures from phosporic acid. - Gastric inflammation and gastric lining erosion due to caffeine. - Nutritional deficiencies. Soft drinks are empty calories! - Imbalance of body's pH level. 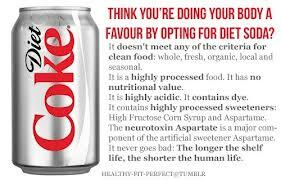 - Neurological disorders from artificial sweeteners and caffeine. 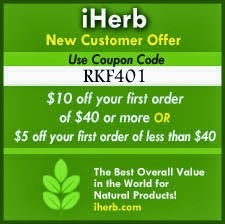 - Skin problems like acne due to the acidity of diet sodas that lower the body's pH levels. - Neurological disorders and mood swings from artificial sweeteners. Sodas are the world's other drinking problem. It is our responsibility to teach our children to be wise in choosing their foods and drinks. Do you find it hard to stop your soda habit? Will you try for your health's sake?